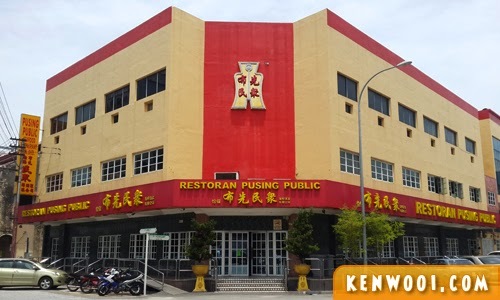 Pusing Public Seafood Restaurant (or also referred to as “Man Jung” in Cantonese) is well-known for its delicious food choices, and it’s also one of the preferred choices to host wedding dinners in Ipoh. Despite being a conventional restaurant (unlike modern hotel ballrooms with red carpet, permanent stage, etc), the exceptional food quality definitely make up for it. 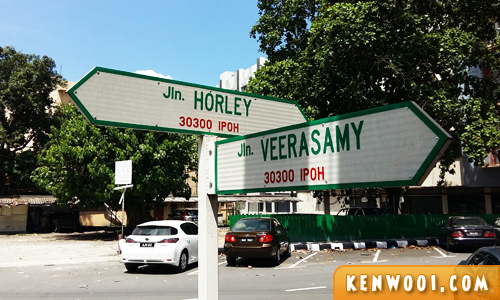 Located at the heart of Ipoh town, it’s within driving distance from other famous Ipoh food in town. It’s situated at the corner of Horley and Veerasamy streets, and there are ample parking spaces surrounding the restaurant. I’m usually not good at ordering in Cantonese because I know nuts about Chinese cuisine and how to pronounce them… until recently where I started to familiarise myself with the types of available choices. 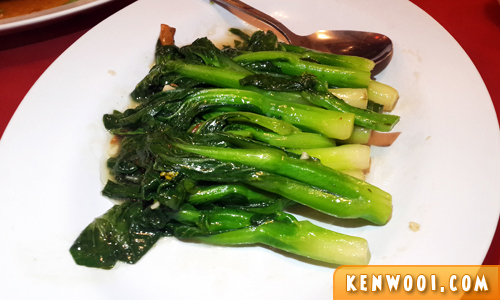 I can now order dishes like… fu yong tan, leng mong gai, gu lou yuk, yada yada. Heh! 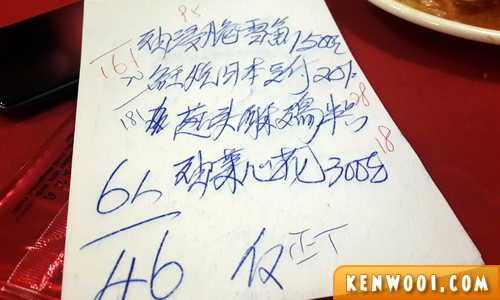 Anyway, here are some Chinese cuisines we ordered during our recent lunch. 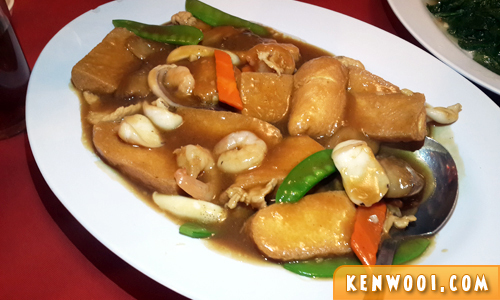 This is our favourite dish, and it’s ALWAYS on our to-order list whenever we’re dining there. 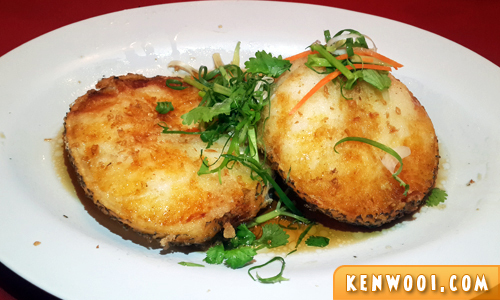 This deep-dried cod fish with soy sauce is crunchy on the outside yet tender on the inside. A must-have recommendation if you’re visiting! 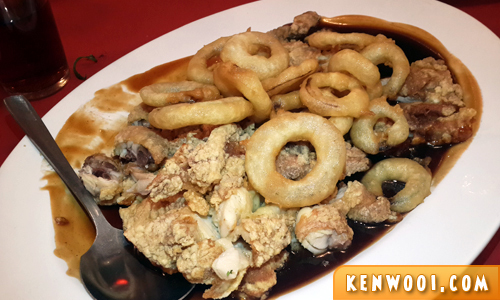 Deep-fried lemon chicken with fried onion rings. 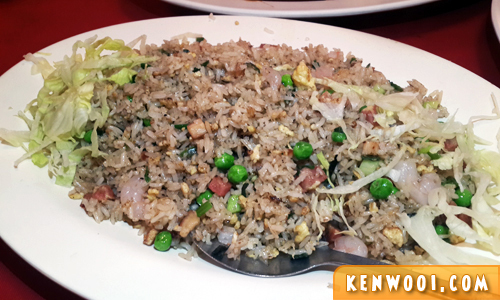 We usually have white rice during our meal, but if we didn’t there’ll be a plate of fried rice as well. That’s it! Note that it’s quite high-end when it comes to the price. Credit cards are accepted! Renting Car in Melbourne? Here’s How! Glad to read your blog, disappointed with hawker stuff here, went to this restaurant you featured, really great food value for money! Ate there 3 times already, all the recommended dishes featured here, saving grace for my trip here, many thanks!